The blossoms are gone on my crabapple tree and a couple of wrens have built a nest in the birdhouse. But I just had to paint the beautiful pink blossoms again when I think of how magificent the tree was in bloom. 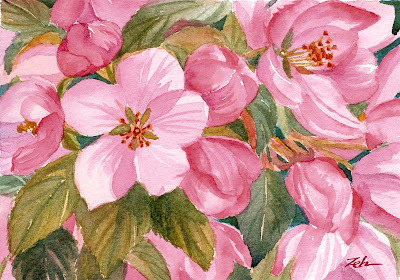 You can find my watercolor florals for sale at JanetZeh.Etsy.com. Thank you for stopping by!